Fox Meadows Software (FMS) makes the electronic medical records and practice management software, Intelligent Medical Software (IMS) Suite — formerly known as SuiteMed. Founded in 1994 and located in South Carolina, USA, Fox Meadows Software’s first product was designed as a simple practice management solution. Since that time, FMS has sought input from the thousands of physicians, office managers, and billing consultants who have used the system and leveraged their suggestions to develop the IMS platform into the robust medical software solution that it is today. 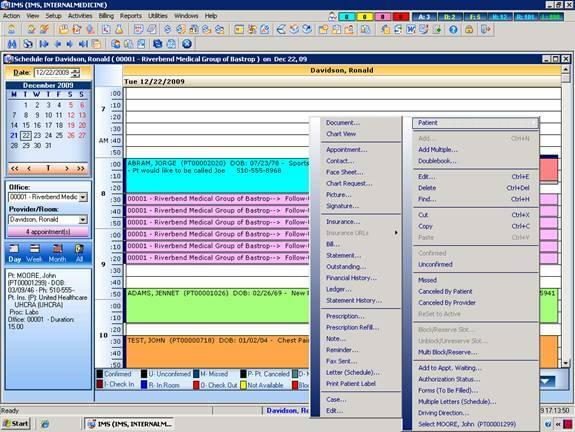 Fox Meadows’ IMS, in addition to standard EHR/PM functionality, includes innovative solutions for managing clinical workflows; the IMS practice management system utilizes a task management interface, similar to task management systems in project management software, to allow easy planning of patient encounters, billing procedures, and day-to-day operations. Also, Fox Meadows’ IMS offers a form creation tool, allowing providers to quickly and easily generate referral letters, consults, and other forms that will auto-populate with relevant information. Additionally, the IMS EHR supports barcodes for medications, dispensing, and inventory management. Fox Meadows Software is so confident they can help your practice meet Meaningful Use Incentive Program requirements with IMS that they offer a money-back guarantee; as IMS is only certified for 2011 standards at the time of the last update noted on this page, providers using Fox Meadows’ IMS who are attesting for Stage 2 of the Meaningful Use program in 2015 may put that guarantee to the test. Fox Meadows does offer a discount on their EHR/PM suite to practices that choose to utilize their outsourced medical billing services. Not sure if Fox Meadows’ IMS fits your needs? Check out more practice management and electronic medical records software in our EHR Product Selection Tool. Learn everything you need to know about Fox Meadows IMS. Our experts will reach out to you shortly.